Automate business processes, manage data, and make your work easier with custom applications. With Zoho Creator, you have everything you need to build your custom application so that your can collaborate online with your team. You don’t have to be a programmer to design great applications. Zoho Creator’s drag-and-drop interface enables you to create custom business applications in days rather than weeks. Use custom reports to sift through large amounts of raw data and make meaningful decisions. Access and update your data wherever you are with Creator’s native iOS and Android apps. You can instantly capture signatures, scan bar codes, and get location details using your mobile device. No two businesses work the same way. And that’s why you need a customized solution to sustain your unique process. It doesn’t have to be hard, though. Use Zoho Creator to build an app that’s a perfect fit for your business. You can even make mobile apps to complete tasks on the go. You need a right platform to bring great ideas to life. Zoho Creator’s drag-and-drop interface makes it easy for any non-programmer to build custom applications. 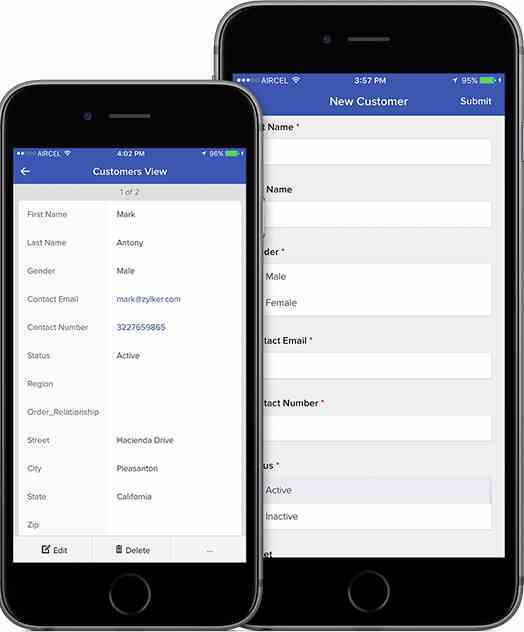 Drag and drop fields to collect varied data like names, email addresses, and customer feedback. 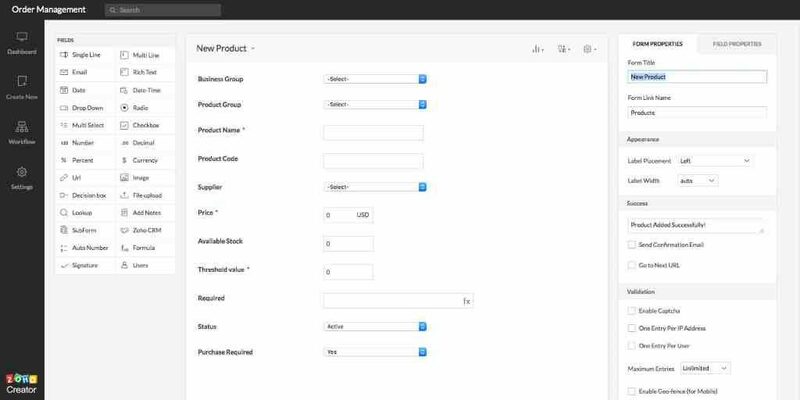 Perform data entry checks and display error messages when incorrect data is entered into your forms. Customize and embed forms on your websites, blog posts, newsletters, and even on your Facebook page. Streamline your business, and spend your time where it’s needed most. Drag and drop complex workflows and save time with the Deluge script builder. 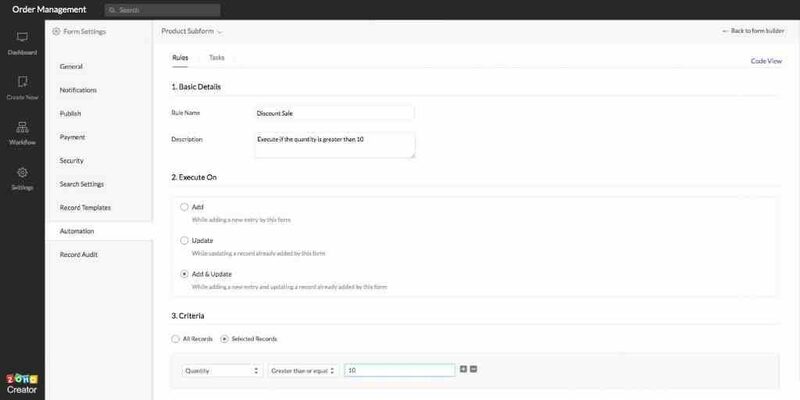 Assign roles to your users and provide access to forms and reports relevant to their jobs. See who has changed records and when it happened through record audit. Let users see only what they need to see. Keep your data in the right hands with Zoho Creator’s collaboration and sharing tools. Share your entire application or parts of it through a public link or a private email with users in your organization. Get real-time SMS or email notifications about orders, payments, and other transactions in your application. Build custom dashboards to monitor your performance indicators from one place. Analyzing data with the right tools. 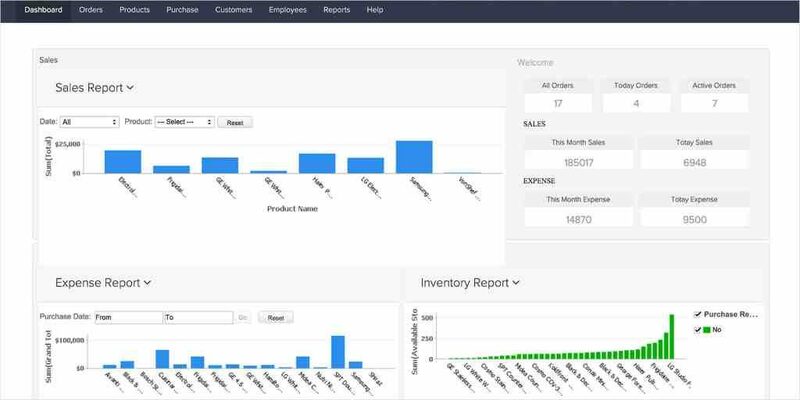 Find insights within your data with Zoho Creator’s reporting tools such as pivot charts, spreadsheets, and dashboards. Integrate your business applications and make data collection easy. Display your data as lists, calendars, summaries, grids, spreadsheets, and more. Sort and filter your data to fetch the information you need without hassle. Schedule periodic tasks to send out reports, event invites, and reminders. Get as much work done on your phone as you would in the office with Zoho Creator’s native mobile apps for your iOS, Android, or Windows devices. Integrated with other Zoho’s CRM, SalesIQ, Subscriptions, Books, and Reports, and manage all data on a single platform. Collaborate, communicate, and share information in a centralized place outside of Zoho. Configure SMS notifications with the default Creator system, or with other SMS providers like Twilio, Clickatell, Screen Magic, ClockWorkSMS, and Hoiio. Create invoices, track expenses, manage your payroll, and automate your entire accounting processes from Zoho Creator. Process credit and debit card payments through PayPal and accept payments online. Pull lead or contact details from Salesforce and get work done without a hitch. That is correct. Zoho has a Free Version – and it is Free Forever – Really! Grow your business with a free online Zoho Creator. You can pay on a monthly or yearly basis (and get a ~10% price break), with NO long-term contracts. Start a trial to see what you think. It is a forever free trial. You can try out different editions to see the more advanced features. Then your account will revert to a free trial after 15 days…but, you won’t loose any data! You just won’t have access to the more advanced features. You have nothing to lose.